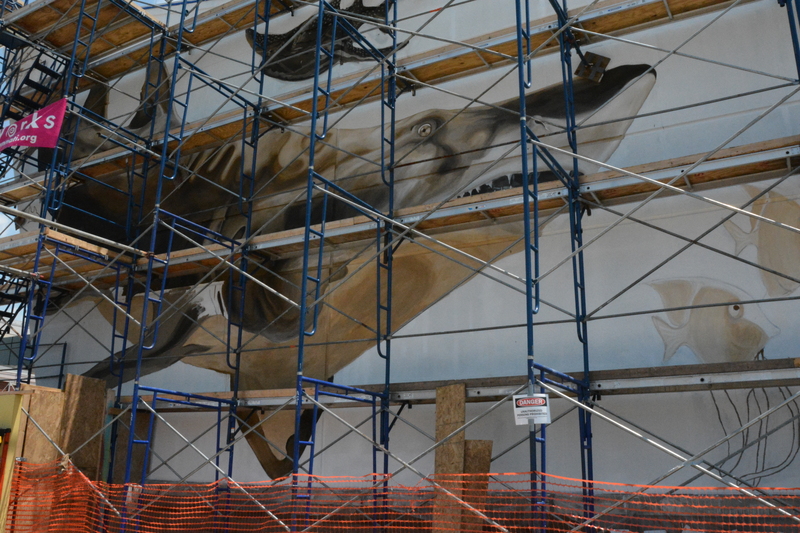 NEWPORT, Ky. – The second week of work on Newport Aquarium‘s new #SharkWall began Monday (June 30), with the ArtWorks Cincinnati artists focusing on the underpainting of the wall. 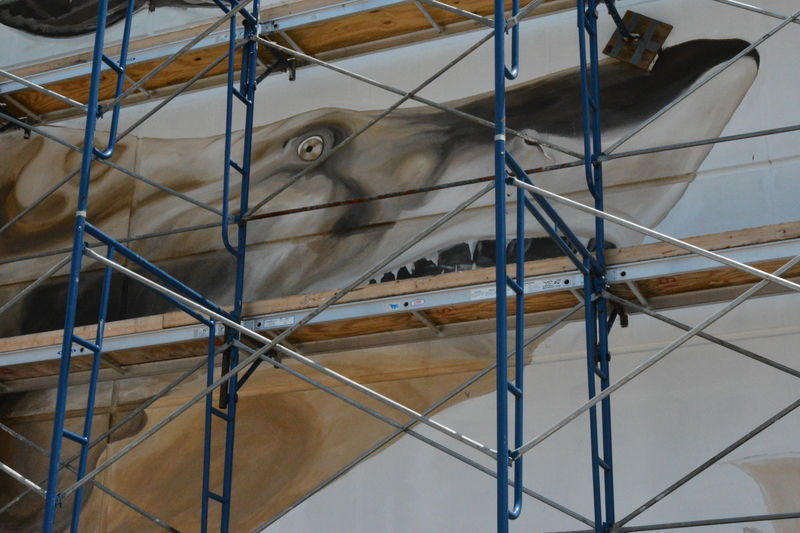 The #SharkWall underpainting consists of darker colors, such as brown and gray, that go over all the animals to add overall depth to the mural once the rest of the colors are added later. 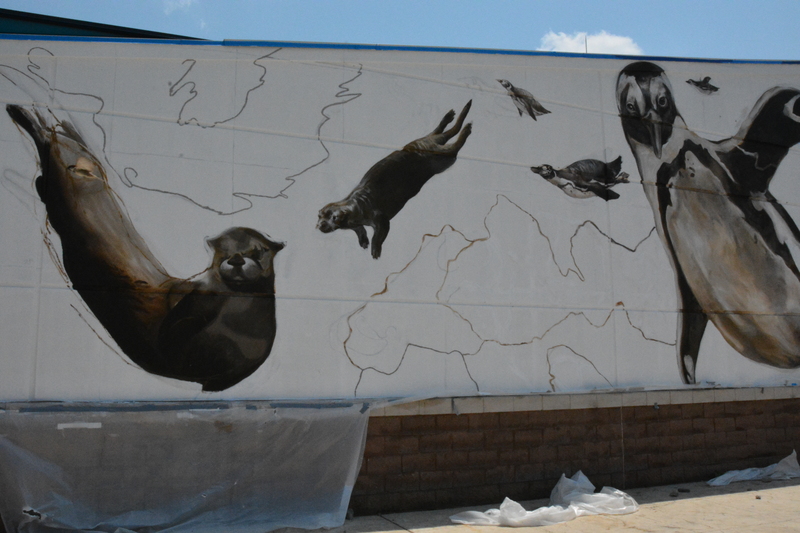 Currently underpainting work on the largest penguin on the far right of the wall and the shark ray on the far left are well under way and should be completed Wednesday. The plan for the artists is to work from the outside and meet in the center. Once the first layer of underpainting is completed, they will begin adding colors over the current layers to get the animals to their finished look. This will be followed by a translucent gloss that will give the #SharkWall an underwater appearance. Rosalind Tallmadge, the designer of the #SharkWall, is happy with the progress she sees. Tallmadge, who is in her eighth summer with ArtWorks Cincinnati, is very excited to be working on the project. This is the first mural she’s designed of this size and admits that it’s the most in-depth and, with its location, the most visible mural she has ever worked on. 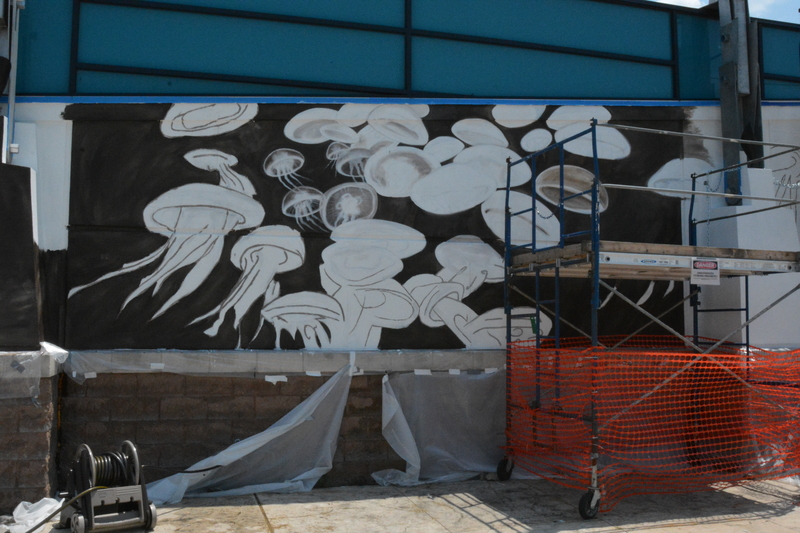 The mural will be approximately 300 feet wide, 35 feet high on the far left and 25 feet high on the far right. ArtWorks apprentices Shealyn Hollingshead, a student at Ohio University, and Kara Crowe of St. Henry High school, are excited to see the progress of the #SharkWall. According to the duo, it’s taken nearly three days to finish the underpainting process, with the final touches to be completed by midweek. For those stopping by to check out the progress in the coming weeks, ArtWorks employees have been fielding questions from the public. Apprentice Jenna Webster, a soon-to-be Northern Kentucky University student, has emerged as the designated person guests would want to speak with. Like many of the apprentices, Webster discovered the opportunity through her school and she is thrilled about her involvement. “I’m really, really enjoying this so far and we’re making a lot of progress,” said Webster. So if you happen to walk by while they’re working, say hello to Webster and the team as they continue working! Spectators can already be seen walking slowly to picture just how the many soon-to-be filled-in lines will come to life. One of many who were admiring the work this week is Leigh Whitaker, a Newport Aquarium Annual Passholder. “I like it so far, it looks great! I wish I could do that, I wouldn’t even be able to do that on a small scale,” said Whitaker as she walked from end to end checking out the progress. Whitaker says she will definitely be back to keep up with progress now that they’re starting to take shape. “I’ll have to bring my daughter out here, she loves art,” said Whitaker. The ArtWorks Cincinnati team believes it will be putting in the finishing touches on the #SharkWall in just four week. Newport Aquarium shares Whitaker’s enthusiasm and looks forward to seeing the final product. This entry was posted in #SharkWall, 15-Year Anniversary by NewportAquarium. Bookmark the permalink.